2011 December | Madplanet.com Inc. Yesterday my new MacBook Air arrived and I started to set it up. Going to a smaller device I did not copy the content of my original 17-inch laptop over but started from scratch again. Funny thing today is that I got an email from Apple that the Air was shipped even though I received it yesterday and the first delivery was made two days ago. So it seems that Apple had a problem with my shipment but at least I got it and it is working perfectly. The first thing that amazed me was how light it is. Carrying it around compared to the 17-inch is a breeze. The overall speed is quite slower but not enough to be a drag. Of course creating or extracting large ZIP files is progressing a lot slower but that isn’t my daily business. 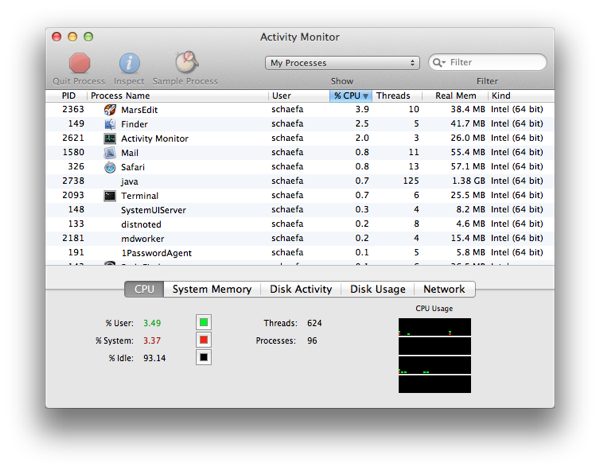 Developing on CQ5.4 from Adobe (Day) is comparable and still beats my current Dell desktop at my workplace. Having the Air connected to my 27-inch monitor it nearly feels like the 17-inch and so working at home with the Air is more or less the same. On the road the screen is small but because of that easy to use in a car or plane. If I am on-site it might be a little bit small for regular development but for now I rarely do that. For now the only reason why I would go back to my 17-inch is if I need to have a powerful development machine away from my home and there is no way I could have an external monitor with a better resolution that the Air which is pretty good with 1440×900.